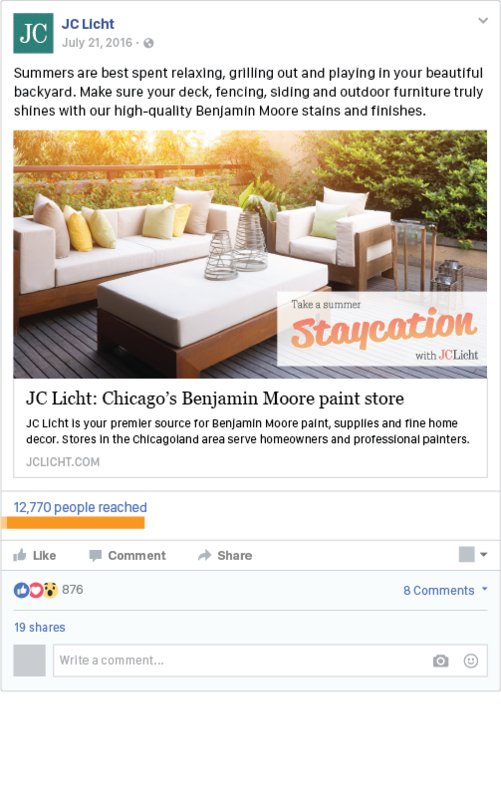 JC Licht has been one of Chicago’s go-to paint and sundries store since 1907. 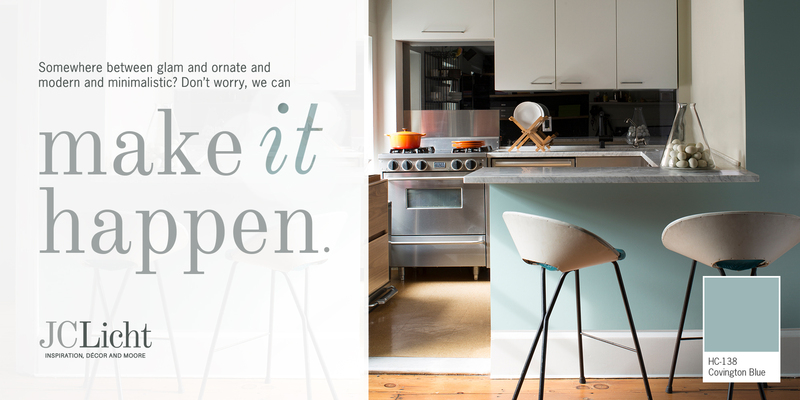 After being bought by Benjamin Moore, the family-owned company wanted to get back to its roots. 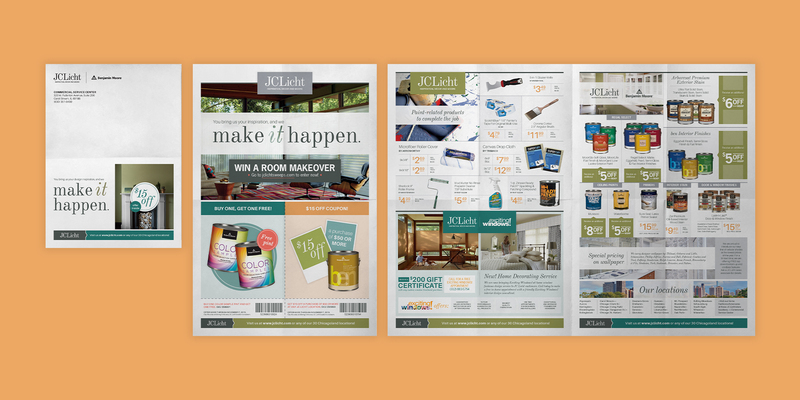 Our challenge was to develop consistent messaging that communicated JC Licht’s neighborhood vibe, as well as the fact their employees stick around – while also going above and beyond for their customers. 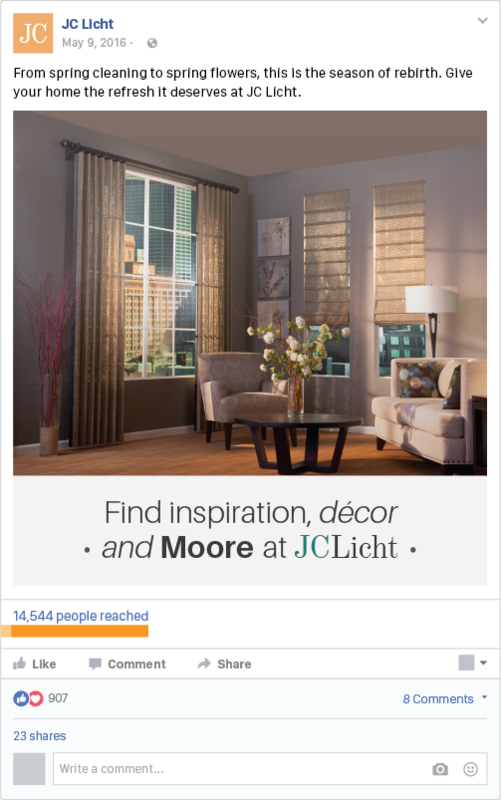 Customers often bring their source of inspiration – their it – to JC Licht and work with their professionals to carry it through in their homes. They know it when they see it, but sometimes they need a little help. And that’s where JC Licht comes in. This notion of JC Licht knowing exactly how to figure out how to make customers’ inspiration led us to the brand idea: Make it happen. We aimed to elevate their look by incorporated a clean, serif typeface alongside a bold palette. Then we utilized the concept of a paint chip to combine the design with the imagery, leading the paint chip to become an element of its own throughout the branding. Although there are many colors, each is used sparingly to achieve this welcoming, high-class feel. And the best part of this creative branding? Its ability to change colors with the imagery. 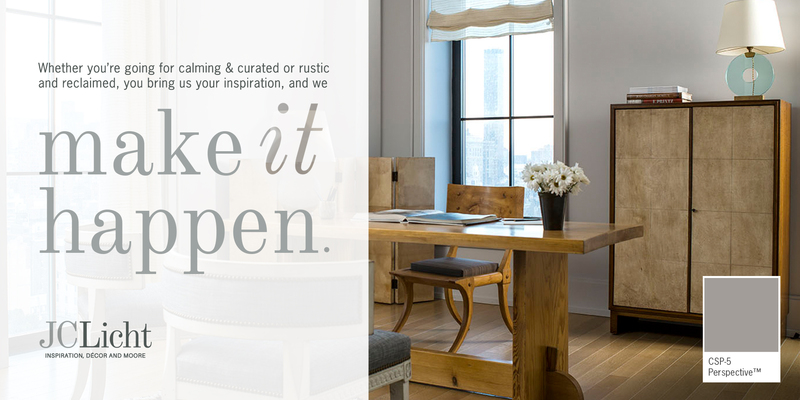 We wanted to engage with our “do it for me” target audience, so we took to Facebook, Twitter, Instagram, Houzz and Pinterest to introduce the new branding to Chicagoland residents. 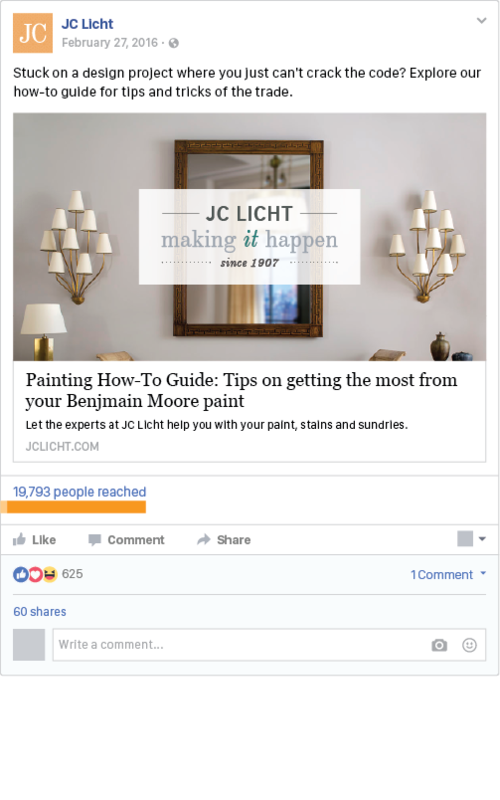 Through a mix of engagement and conversion posts, we remind our audience that JC Licht is their destination if they want to make it happen with superior Benjamin Moore products. 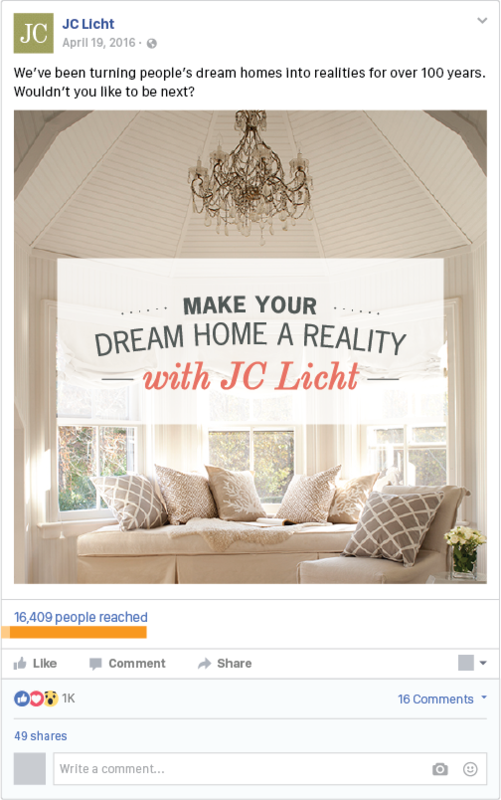 And while that overarching brand idea is consistent throughout our social management, we also developed new campaigns centered around the changing seasons and the JC Licht products customers can use to make their dream homes a reality. 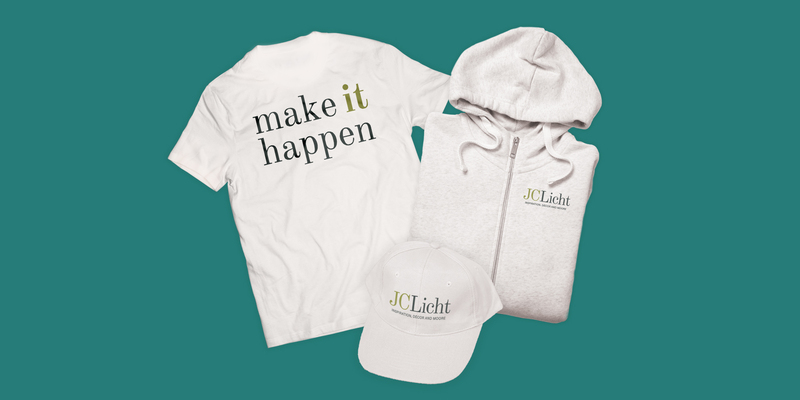 We recreated nearly all of JC Licht’s assets, ranging from shopping bags to mailers and even truck designs. Some projects called for a single designated color for certain audiences, while others involved all four colors used sparingly. We also recreated their quarterly circular. 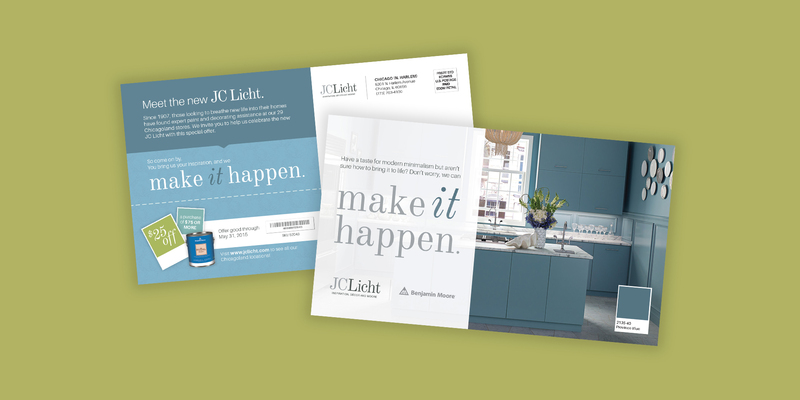 By choosing quality stock paper and classing up the imagery and layout, we created a circular that you can’t find at any old store – only JC Licht. 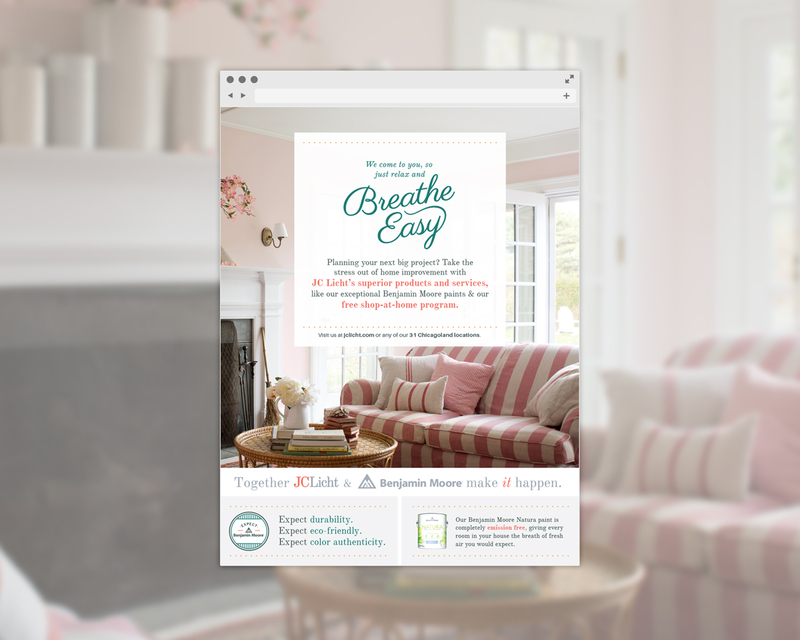 Spring is the season of renewal, so we decided to kick off March with the Breathe Easy with JC Licht campaign. 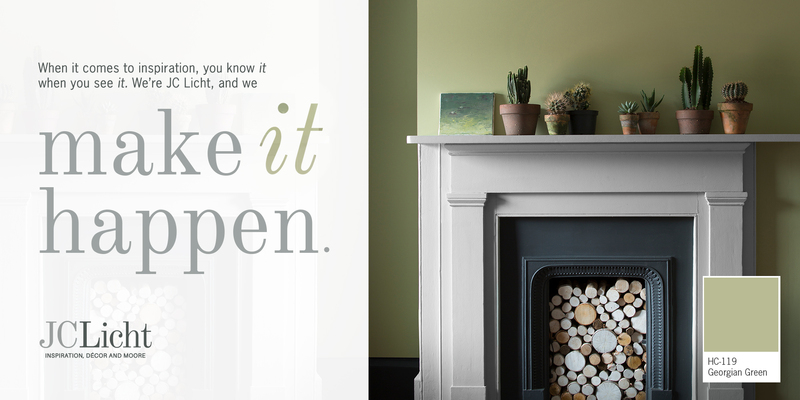 Not only did this idea tie into Benjamin Moore’s eco-friendly and emission-free Natura paint line, it also introduced customers to JC Licht’s Shop at Home program, where a personal designer can come to a customer’s home (free of charge) and help them make it happen. In addition to their superior paints, JC Licht also carries high-quality Benjamin Moore stains and finishes. So for the warmer months, we developed a seasonal campaign based on the idea of forgoing a stressful vacation and instead taking a staycation. 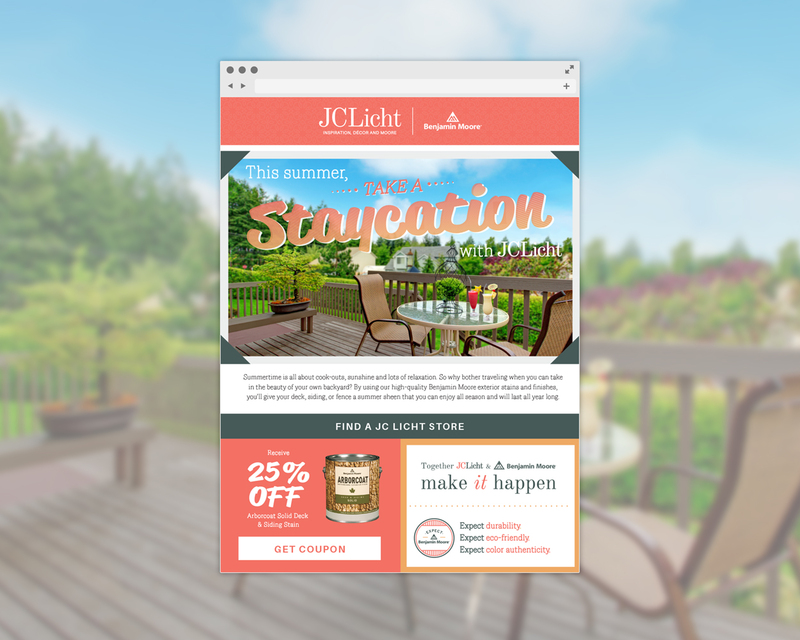 To launch this campaign, we designed and developed a Staycation email inviting JC Licht customers to turn their backyards into staycation paradises by upgrading their decks and outdoor furniture with Benjamin Moore products. 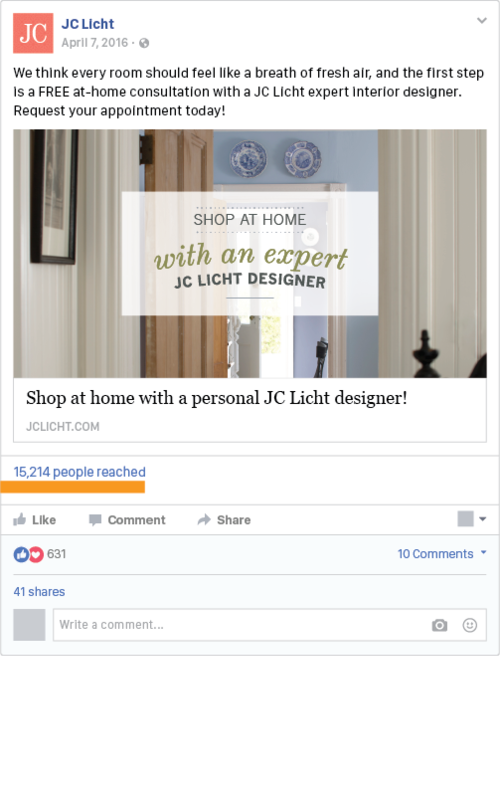 We wanted to engage with our “do it for me” target audience, so we took to Facebook, Twitter, Instagram, Houzz and Pinterest to introduce the new branding to Chicagoland residents and offer them a chance to win a room makeover, courtesy of JC Licht’s superior design services and products. 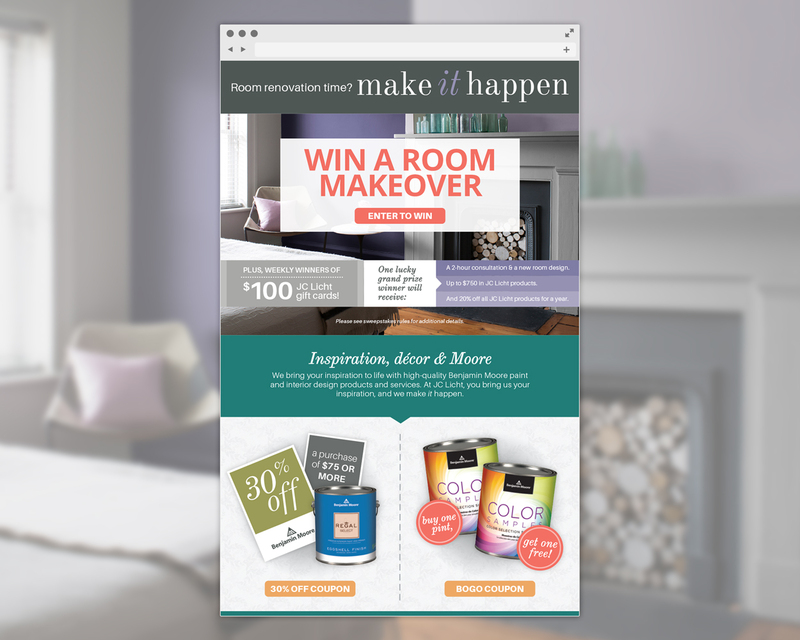 Not only did one lucky winner get a room makeover, but weekly winners also received $100 JC Licht gift cards to put towards creating their dream homes.